Maggie Mentions.... Between high school sports, activities, and academics it's hard to stick to a clean and consistent skin care routine. Big zits seem to show up as much as pop quizzes, and that needs to stop! Keep a pack of Burt's Bees exfoliating wipes in your sports bag. Quickly wipe face before practice or a game. If you are wearing a face mask be sure to swipe the side of the mask that rests on your forehead. (It is covered with bacteria and dirt). Keep blotting sheets in your back pack. Use in the late afternoon when there is shine on your forehead and chin. 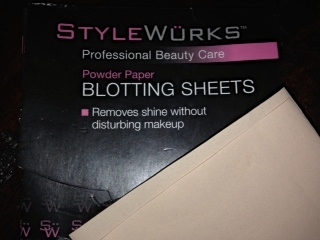 The sheets absorb all the oils and leave a thin layer of concealing powder on your face. They really work! Great for a long day. My new favorite product is the Bare Minerals Blemish Remedy concealing powder. This actually fights acne while covering your skin. You have to get the blending brush as well because it blends the powder perfectly. Don't forget to never go to bed with any make up on. A clean face is a clear face.